Contrary to what many believe, cremation is not an alternative to a funeral nor does it limit choices, but in fact, increases one's options. It is performed in a respectful and dignified manner and can be memorialized in many ways. In 2O14, we opened our own Crematory and Tribute Center as an addition to our formal chapel at the Stuart facility. We are the only full-service funeral home in Guthrie, Adair, Dallas and Madison Counties with its own on-premises crematorium. Let us tell you about our unique facility and the benefits to our community of performing cremation directly under our supervision. A funeral service followed by cremation may be exactly the same as a funeral followed by burial. It can be elaborate or simple and traditional or nontraditional. Customary Cremation Service will be just like a complete funeral except cremation will follow instead of burial. 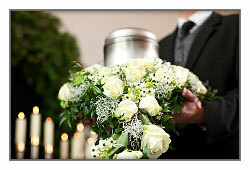 This can be accommodated by the use of a special cremation casket or a ceremonial (rental) casket. Following the viewing or ceremony, and eventual cremation, the cremated remains can be buried, scattered, or returned to the family for safe keeping. Urns are used to hold the cremated remains. They are constructed of semi-precious metals, ceramics, woods or bio-degradable materials. Memorial Service/Commemorative Gathering involves cremation soon after the death followed by a service at the funeral home or other location where the body is not present. Often the urn will be at the service as an appropriate focal point. A period of visitation may be held before or after the ceremony. A Non-Ceremonial Cremation refers to a cremation without any formal ceremonies. Niches - The cremated remains of your loved one may be safely held in a nice of a columbarium at a cemetery or one's place of worship. Cemetery Burial - In ground burial on a family plot - Urns may be buried at the head or foot of a grave site. Scattering - Ashes may be scattered freely within a dedicated, natural environment. Often people wish to retain some portion of the remains for commemorative purposes. We maintain a large selection of special, small keepsake urns for reserving some amount of the ashes. Personalized Memorialization - Inscribing your family member's name and a special saying on a tree plaque, park bench or other special memorial. To begin with, it is probably easier to describe what cremation isn't. Cremation is not final disposition of the body, nor is it a type of funeral service. Rather, it is a process of reducing the human body to bone fragments using high heat and flame. It depends on the weight of the individual. For an average size adult, cremation takes from three to four hours at normal operating temperature between 1,600 degrees F to 2,000 degrees F.
Cremated remains resemble coarse sand and are whitish to light grey in color. The remains of an average size adult usually weigh between four to five to eight pounds of cremated remains. No, a casket is not required for cremation. All that is required by state law is an alternative container constructed of fiberboard or wood which is cremated with the body. The only time a casket is required is when the family chooses a public service with the body present prior to cremation. 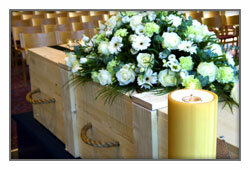 For these occasions we offer a selection of cremation caskets and/or economical rental casket. Is it possible to have a funeral before cremation? Yes. A common misconception is that cremation is an alternative to a funeral rather than an alternative to burial. In all cultures outside America, where practiced widely, cremation is highly ritualized and done with ceremony at which the deceased is present. Today we find people choosing cremation simply as one step in the overall process and not as a substitute for the funeral. 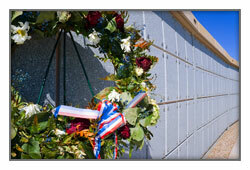 It is one of the reasons we offer ceremonial (rental) caskets for the funeral prior to cremation. No. Most funeral homes subcontract this delicate procedure to a third party provider. Often, the family incurs additional transportation expenses and needless delay. By contrast, we own our cremation equipment at our Stuart facility which is operated by our fully licensed and highly trained staff. The cremated remains are placed in a plastic bag and urn of your choice. We have a large selection of urns for you to choose from. We have developed the most rigorous set of operating policies and procedures in order to maximize our level of quality and minimize the potential for human error. Positive identification of the deceased is assured throughout each stage of the cremation process. We only allow certified Johnson Family personnel to operate our cremation equipment. You have a right to view and select from a variety of cremation merchandise that is used in the cremation process (cremation containers) and that is used to subsequently contain the cremated body (Urns). You have the right to review a Cremation Authorization Form and have questions answered before signing the form. You have a right to be advised of various funeral home policies and applicable legal requirements prior to finalizing the cremation arrangements. When the body is transferred from a hospital or medical examiner facility, it is in the best interests of the survivors and the funeral home / crematory personnel to insure the correct identity of the deceased before cremation. Unless the deceased is embalmed for a public viewing or funeral before cremation, the identification must be for a limited time only and may be done by anyone who represents their ability to do so. (We require at least one family member to view for identification purposes). Prior to identification, the mouth and eyes of the deceased are closed by accepted methods of mortuary science (for aesthetic purposes). A disinfectant topical cleansing is performed when embalming is declined. Only one body will be cremated during the cremation process. The cremated remains, consisting of bone fragments, will be diligently removed from the cremation chamber and pulverized into small fragments. Because the cremation chamber is lined with porous material, it is not always possible to remove small traces of the cremated remains. The phenomenon of cremation is still largely unfamiliar and emotionally uncomfortable for some Catholics. Although cremation has been a practice of the Catholic Church since 1963, restrictions allowed very few Catholics to choose it, In recent years, changes to these conditions made by the Catholic Church have enabled cremation to be considered an acceptable option.